I was born in the early 80s so, I grew up on Bonnie Bell Lip Smackers, wide leg blue jeans, and TGIF shows like "Family Matters", "Full House", "Step by Step" and "Hanging with Mr. Cooper". Lately, I've been having a bit of a craving for all things 90s. 1. Flannel shirts! I found a vintage one at the thrift store in the men's section the other day. And it's so comfy. I've been living in it, with my favorite jeans and moccasins. It's on my thrifting wish list to find a couple more. 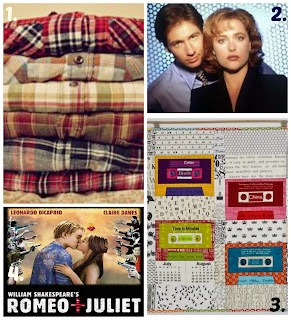 I found this listing on Etsy for a mystery flannel shirt. 2. Before I loved Doctor Who obsessively, I loved the XFiles (affiliate link). It was one of my favorite shows. My mom wouldn't let me watch it when I was a kid, because it was too violent and it had aliens in it and murders and stuff. But, I used to sneak episodes when I could. The first Christmas after we got married my husband bought me all nine seasons (they were on special after Thanksgiving for dirt cheap). I watched them all in order and then the other day, I decided I should watch them again. So, I started rewatching them. And I love them just as much as the first time I saw them. 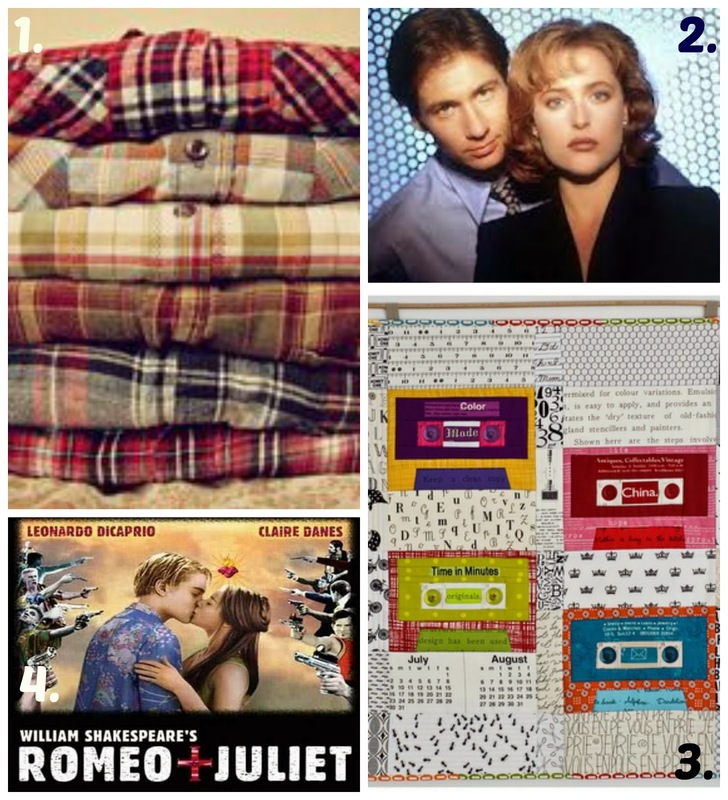 But, I have noticed that the wardrobe is all sorts of 90s awesomeness. Scully has these really awful wide leg pant suits and Moulder has these super wide ties. But I still love all the mystery and unexplained, alien weridness to it. 3. This quilt is awesome!!! Remember cassettes? Remember making your own mix tape by taping your favorite songs off the radio? This mini quilt is from Sewing Under Rainbow. It's ran by a Polish blogger named Julianna Gąsiorowska. She makes some awesome stuff. There's no tutorial but it does give a girl some inspiration. 4. William Shakespeare's Romeo + Juliet (affiliate link) was my favorite movie in high school. This movie is what started my geeky love of Shakespeare. After watching this movie, I read the play, along with "Macbeth", "The Merchant of Venice" and some sonnets before moving on to Jane Austen. So, I guess this movie laid the groundwork for my love of Jane Austen. Plus, Leonard DiCaprio stars as Romeo and he was a Tiger Beat regular of my Junior High years. And to be honest, it isn't that horrible to watch now. It's aged fairly well. So there you have it: a list of 90s related favorites. What are your favorite 90s things?